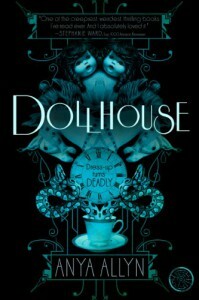 This is, apparently, the first book in the Dollhouse series. Just a side note on the cover here. I do like this one, it's kinda creepy, but there's also a more conventional paranormal YA cover, which isn't really something I would have picked up in a book store (or on Netgalley). I'll admit it, I don't really like dolls, definitely don't like clowns and especially not when they're eight foot tall! Add to that a creepy house, mysterious doorways, some stupid teenagers and a pipe organ, and you've got all the ingredients for a creepy story. From the moment they enter the dollhouse you know some is wrong there big time. It takes some time to find out more about what is happening, and even when this information comes, it's quite confusing and we are left to decide what is real and what isn't. Yes, the ending was abrupt. But if it hadn't been a series, I would not have minded. Sometimes I liked reading a story where I'm left to decide for myself what happens. And I think I was perfectly able to do that given the information in the story. But since, I've found out this is a series. And that's when it started to annoy me. Not necessarily that it's yet another series (there are quite a lot of questions left), but I always think that books should not end on cliffhangers like this one.